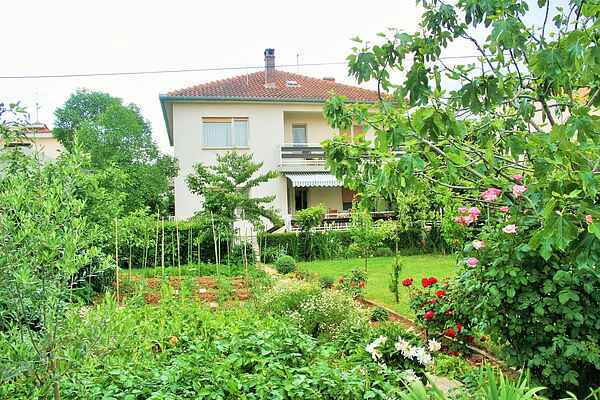 Apartment Iva is spacious first floor accomodation located in a quiet residential area of Zadar. It is situated in a tourist zone of Zadar called Borik but in the same time its location provides its guests a peacufull vacation. Central room is a cozy living/dining room with direct access to the covered terrace. All 3 bedrooms have balconies where you can have your first morning coffee end enjoy a nice garden view. The owner is delighted to offer you BBQ on the ground floor. Beach, shop, caffes and restaurants are within a 10 minutes walking distance from your apartment. Nearby public transport bus line takes you straight to the city center which is 4 km away. There, you can experience atmosphere of an ancient Mediterranean old town with its numerous churches and tourist attractions. Beside local beaches the location of the apartment is perfect as a starting point for exploring whole region. Zadar is surrounded by 3 Nature parks and 5 National parks: Kornati islands, Plitvice lakes, Krka, Paklenica and North Velebit which classify Zadar as one of the most attractive tourist destination in Croatia.